If you’re anything like me, then you love a good gallery wall and that also means you’re a frame hoarder too. I’m guilty as charged. In our small apartment alone, we have 4 areas where gallery walls have emerged and 4 gallery walls means A LOT of frames. Gallery walls can make a huge statement and bring life to blank apartment walls but they can also go very stagnate, very fast. That’s what I’m currently struggling with at the moment. In my haste to hang something, anything, on the walls when we first moved in, I did so without much thought or intent and now I’m left feeling meh about most of it. I haven’t quite landed on my ideal design solution for any of these areas so while I’m pondering over my options, you know I just can’t leave well enough alone. So! I decided against ripping everything down and starting from scratch, but believe me I considered it, but then where would I store all the frames? Instead I just decided to tweak a few frames throughout the house and see what sticks because who knows…maybe I’ll end up loving it all over again. 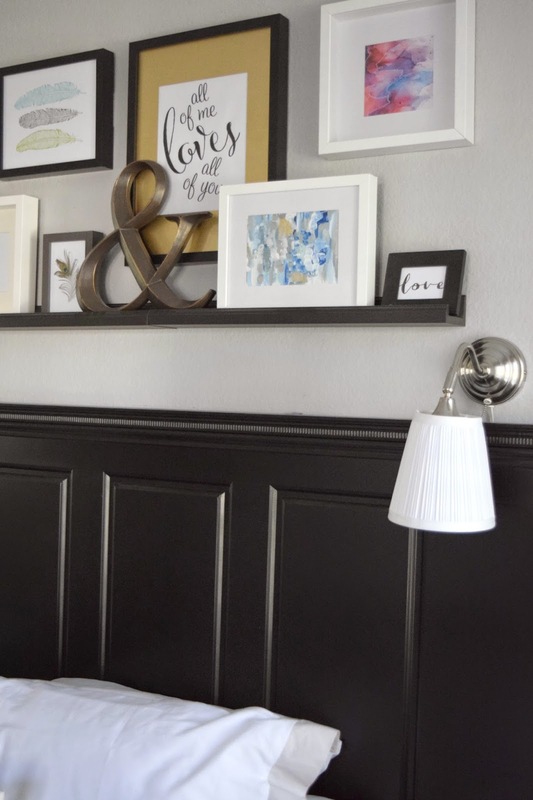 So while I’m busy giving my gallery walls a mini-makeover I thought I’d share with you a few quick and simple ways to tweak a boring ole picture frame. The first frame tweak I worked on was this “all of me loves all of you” print I had framed in my go-to Ikea frames. I downloaded this print from an Etsy shop a while back and I think the bedroom is the perfect place for a print like this. Just not sure I’m digging the whole composition of the gallery wall above the bed just yet…I have nightmares about giant earthquakes and the gallery wall crashing down on our heads as we sleep blissfully unaware. The print had a white background and basically just blended right in with the white mat, which for me was no bueno, so I took the mat out and gave it few thin coats of my favorite gold spray paint. Although I love the look of this gold spray paint in other applications, I’m not so sure I love it here. But hey…it’s just paint, right? And speaking of paint…did you know that mats can be painted for an instant new look? No? Well now you do. And not just with spray paint…with any paint! Just be sure to let your painted mat dry ample time before re-installing it in the frame. This frame tweak was easy-peasy! The next tweak happened in the kitchen and although these frames aren’t technically part of any of our 4 gallery walls, they were still fair game. To jazz these bad-boys up I picked up some cheap flat corner braces from my local home improvement store and screwed them into each frame corner for an instant campaign style look. Just be sure to remove the glass before doing this to ensure you don’t accidentally crack the glass as your brackets are going in. For less than $5, these cuties were looking better already. The verdict? Dig the frames, hate the kitchen. Faux maple cabinets with dark speckled granite countertops? Bleh. A pop of color! Using my go-to Ikea Ribba frame, I painted the inner edge of this extra deep Ikea frame a coordinating pop of color to match the print I downloaded here. The pop of color gives the print an extra layer of dimension and interest. 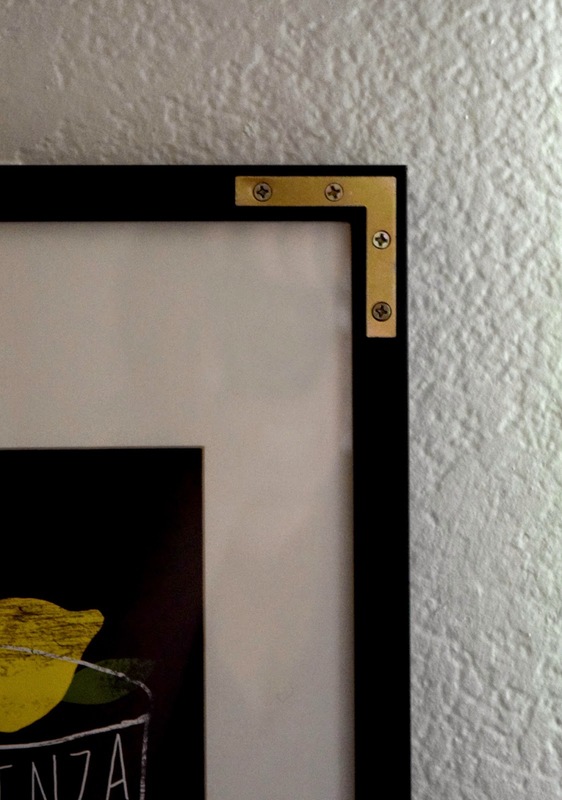 This extra deep frame from Ikea has a square insert that can be removed or kept in place to allow for different picture display options. 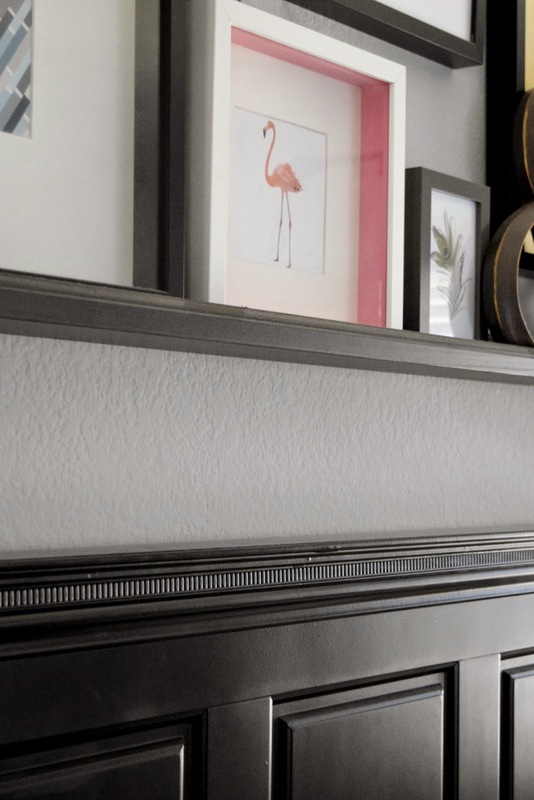 To achieve this look, I removed the insert, primed it with some spray primer, mixed up some pink, red, and white craft paint to mimick color of the flamingo and then painted all 4 inside edges of the square insert. I let the insert dry for a few hours before re-installing it. Here’s the result! You like? I’m loving the pop of color this little update adds to the space. 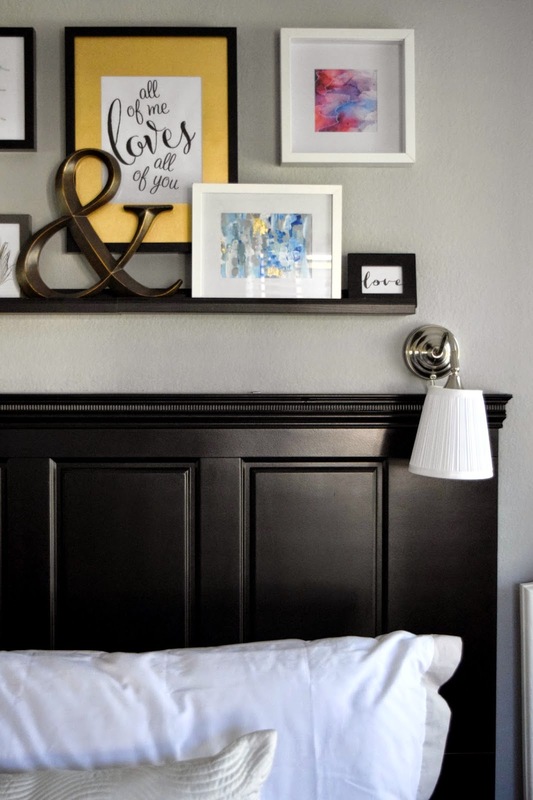 Can’t believe it took me this long to make such a simple & easy update to a boring frame! All 3 of these “tweaks” took me less than 10 minutes to complete, not including dry time. While I’m not head over heels in love with the gold painted mat, it’s an easy enough fix, and these tweaks may just hold me over until I figure out what to do, or not do, to these spaces. What do you think? 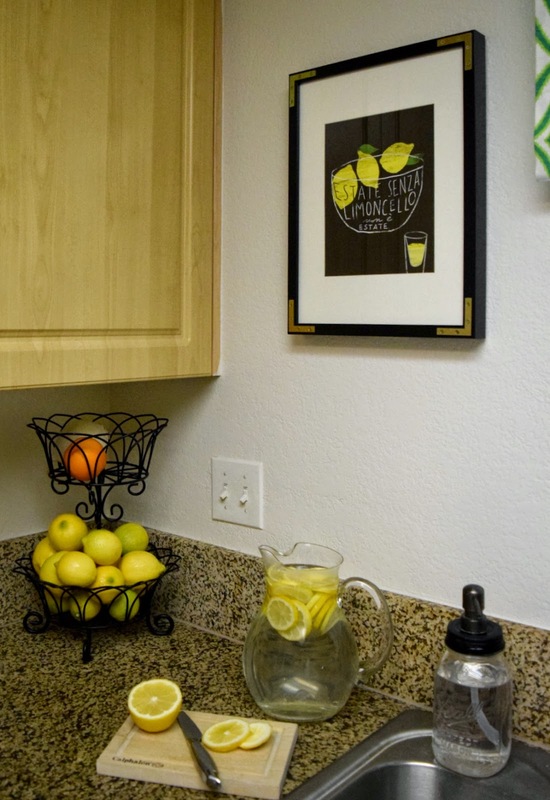 Will you try any of these ideas out in your own home? 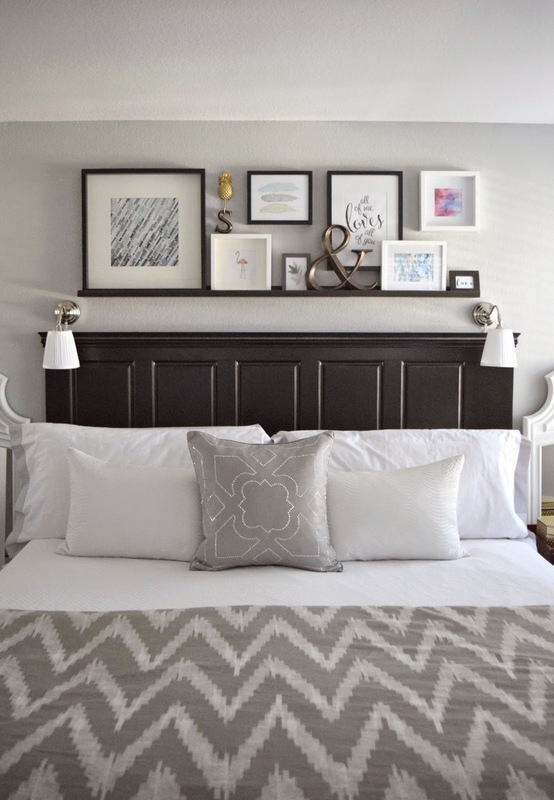 Do you love gallery walls just as much as this girl?